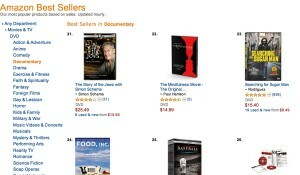 Last week, in a spur of sales we hit #22 on Amazon Best Seller list for documentaries. That’s amazing! 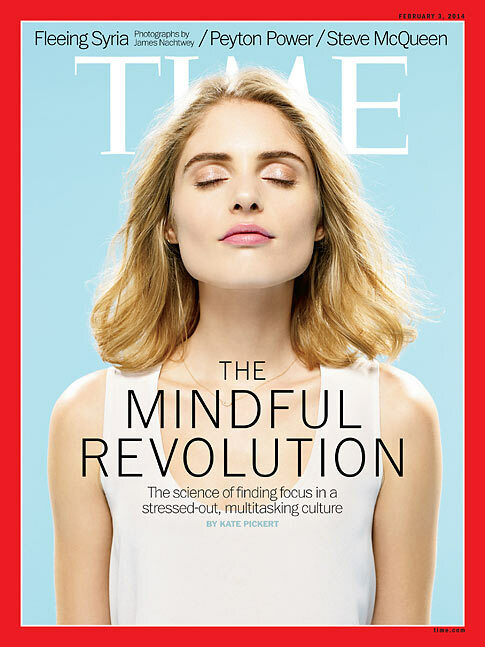 It’s really great to see this type of momentum pushing toward mindfulness. The need is there! And the magic that is necessary to make change is not so far off. It’s as much effort as spending that one extra moment to recycle a piece of trash instead of throwing into the main waste. If we individually spend a moment to be mindful, then as a culture we can begin to awaken and realize what we need to do. What that next step will be! Yet, the hardest thing we need to do is sometimes so very simple. One Zen master and his student walked into a funeral parlor—filled with bereaved family and friends—the student takes his hand and pounds it loudly on the coffin, Bang! He burst out. The shocked mourners watch and soon return to normalcy. Are you waiting for the punch line? In Zen, the punch line is realized through a shift in perspective from our normal feeling of IN our selves to a feeling that is OUT of our selves. Simply, a shift out of ego is what is necessary and it is a mindful state that can be obtained through mindfulness practice. “I’m not saying alive, I’m not saying dead.” Who can say what we keep alive or don’t keep alive? It’s up to us to determine these patterns—sometimes with the help of professionals and friends. No one can really say. But with more mindful moments in our lives we become more aware of what is alive or dead within us. And most importantly, what we are keeping alive or dead. “I’m not saying! I’m not saying!” This is a blessing from the master to force the student into his own mind to find his own answer and not be told what it should be or shouldn’t be. Those that tell us what we should and shouldn’t do can never really help us unless we decide to mindfully act on it. It’s like telling someone with claustrophobia after shoving him into a small closet, “Oh, don’t be scared anymore, everything will be fine!” Nothing you say or can say will help this person in that moment. They need to realize it on their own and that is the key to awakening. Mindfulness can be that bridge to help us to awaken to what is Alive or Dead in our lives and change it if necessary. “I had a client once, business client, and he said to me, I think it was two weeks before the first session and the second session, and he came back for the second session and said – what did you do to me? I said what do you mean? He said, I have been biting my nails for 20 years, I have tried hypnosis, I have tried CBT, I have tried all these things, I am not biting on my nails, I can’t even get myself to bite my nails, what did you do? I said, well we can agree that I didn’t do anything because I didn’t know you bit your nails, you didn’t even talk about it. I said but I can tell you what probably happened, and I said imagine there’s a world filled with dragons, like evil nasty dragons. And the bite or scratch of a dragon is toxic and will make you ill and stressed and feel horrible. And so you would naturally build castles to try and defend yourself against the dragons. Some people try to build the castle out of money, if I just have enough money the dragons won’t get me. Some will try and build it out of love. If I can find one person who loves me enough or a lot of people who love me a little that’ll keep me safe from the dragons. Some people try and do it through power. If I become powerful enough the dragons won’t be able to get me. Well meanwhile there’s a whole bunch of people, who just the castle building thing isn’t going to work out for them and they are just trying to cope with dragon bites, and so they drink or they smoke or they bite their nails or they over eat, or they do whatever they know to do to cope with dragon bites. What if you wake up one day and you realize beyond a shadow of a doubt that there are no dragons. Now everyone else still thinks there are, you can’t even really talk to them about it, because that’s crazy, of course there are dragons. Well you might go back to your castle building and kind of…you might still build it because its fun but you wouldn’t build it with that same sense of desperation behind it anymore. Yesterday I attended the KPCC’s Crawford Family Forum hosted by Dr. Nick Udall and Dr. Jeremy Hunter on the topic of “Mindfulness—Where Business and the Behavioral Sciences Intersect.” I was struck by how similar several main ideas they discussed were captured dramatically in The Mindfulness Movie. Both Nick and Jeremy are experts on using mindfulness as a tool in business transformation. In their work, the goal is to grow innovation, compassion, and openness—thus creating leaders and organizations for which ideas can flow unrestricted of previous conditioning, outdated thinking, and old pattern loops. 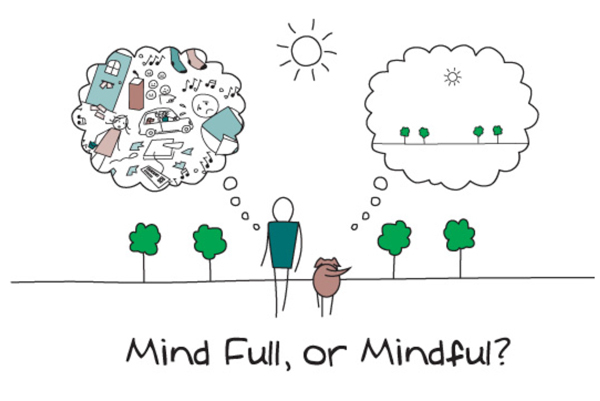 Mindfulness allows us to create space between our highs and lows. Between the fear of the unknown and insight. Between pain and resolve. And in that space, we can take the time to choose our reactions. Oftentimes, we don’t use this space, and instead quickly go to a negative reaction, suffering the resulting pain. Then we cover up the pain—with the many remedies at our disposal (i.e. alcohol, overeating, etc. )—but we don’t stay with the pain. That’s the problem. In that pain or fear of the unknown—be it personal or professional or corporate—there is a valuable energy; and in that struggle we may have our best innovative and creative ideas. If we just allow ourselves to be with the pain or fear, we can work with it as the good and powerful seed it can be—helping us to sprout forward with new growth and life for ourselves and our professional endeavors. Even solve corporate negative patterns that are choking its growth and survival. Be with your pain. Be with your problem, and let it germinate the seed of innovative wisdom that can propel your creativity and forward movement. You can now stream—for a limited time—The Mindfulness Movie, only $3.99 USD. Stream now. When I was a young man of thirteen, I loved to watch the series, Kung Fu, starring David Carradine as Caine or Grasshopper. In fact, I know now that the early exposure through this series of the ancient wisdom of the Tao Te Ching and the Sage Chuang Tzu left an impressionable mark on me and led to my interest and practice of mindfulness when I was seventeen. This ancient wisdom is hinted at throughout the The Mindfulness Movie if you know where to look. Again, they are co-dependent and co-arise together, when you are mindful, you are not mindless, thus when you are mindless, you are not mindful. The truth is that one allows you to recognize the other, just as beauty allows you to recognize ugliness and dark allows you to see light. In the rich mountains of love. Let’s forever join in love together.